WHY coat a valve? The purpose behind coating a valve is to extend the part life and reduce friction. You’re dealing with an intake valve and an exhaust valve. We’ll look at the intake valve first. The INTAKE valve seals the combustion chamber on the intake port side of the head. Prior to that, it is opening to allow air and fuel to enter the combustion chamber. 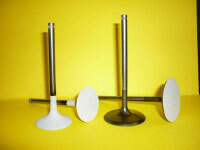 In take valves usually do not suffer as severely as exhaust valves which see combustion chamber temperatures. Therefore, the primary concern is lubricating the valve stem and seat. It is still advisable to coat the face of the valve in the combustion chamber to help retain combustion chamber heat in the chamber. This also reduces the operating temperature of the valve. It reduces the temperature of the back of the valve so the incoming air fuel mix does not pick up as much heat from the valve, as it would, if it were uncoated. On the EXHAUST side we have a more severe environment because the valve is seeing combustion chamber temperatures, which on a normally aspirated engine, can easily be at 1350F; on certain engines this can run even higher. So we definitely coat the face of the valve with a thermal barrier to reduce the heat that the valve absorbs. Then coat the back of the stem. Also, by coating the back on both the intake and exhaust valve after all machine work is done, you permanently bond the lubricant to the areas that will contact the valve seat thus reducing wear in this area and creating a better long term seal.